carly tee: Feeling Grateful & EH Enabler Alert! Happy Thanksgiving sweet bloggy friends and a Happy Thursday too! I have to preemptively apologize for the sappy things I'm about to say, feel free to scroll down for EH Black Friday fun! LOL! The last 4-1/2 years have brought so many blessings into my life, and one of the biggest is my job at Ellen Hutson LLC. I get to go to work everyday with my friends. I get to speak to the best customers, talking about creative products I love and hearing about their awesome projects. I am privileged to be part of the EH design team with some truly talented ladies. And I've met (though sometimes not yet in real life), the best crafty people! Thank you for enriching my life, blessing me with friendship and making me happy. Ok, I'm a little teary but I think I'm done. LOL! On to the Ellen Hutson 10th Anniversary!!! I am seriously so excited for tomorrow! 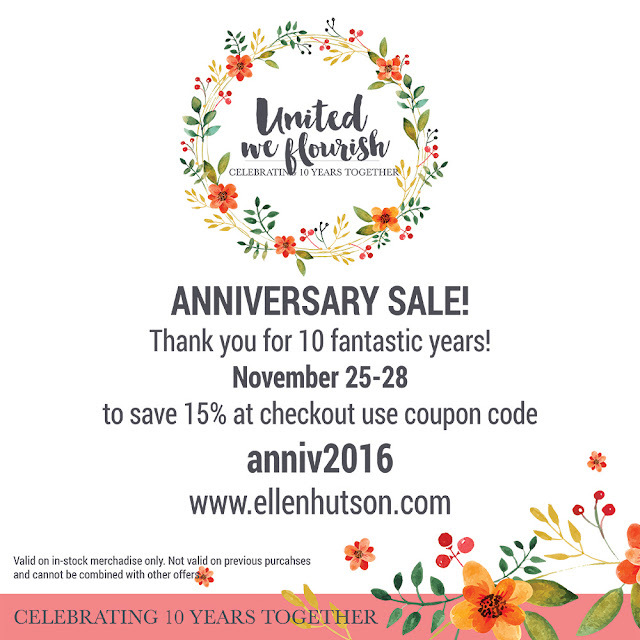 EH is celebrating 10 years with our biggest sale of the year & ever!!! A few sweet customers have told us we should stay home on Friday and rest, but let me tell you!!! Friday is going to be so fun at the EH warehouse! We are wearing our comfy clothes, getting Starbucks (& probably pizza), rocking out to Christmas music and trying to get as many orders shipped out as humanly possible! It's going to be a party!!! Make sure to take advantage of the anniversary savings (and enter our mega giveaway here) and in case you need any help shopping...I know that's silly, who needs help shopping? !...but just in case, I made you a list of my current favorites (with a few sneak peeks of things I've been working on)! 1. Clean Color Markers: I adore these because I feel like they are the perfect medium to transition from all messy, loose watercolored backgrounds & shapes, to a more detailed & precise type of coloring. My coloring is getting so much better (check out that foxy little sneak peek). 2. Happy Card Die: I think this is one of the coolest new dies! Concord & 9th are so cool! The frame die has a "spot" to add coordinating "happy" word or a bouquet and it makes really cool interactive cards. I have a bunch of fun projects to show you soon using it but the pink & gold above is a little sneak. AND there are also add-on dies to use with the frame, Mistletoe and Kind. 3. All Inside Stamp & Die: This set is one of my very favorites!!! 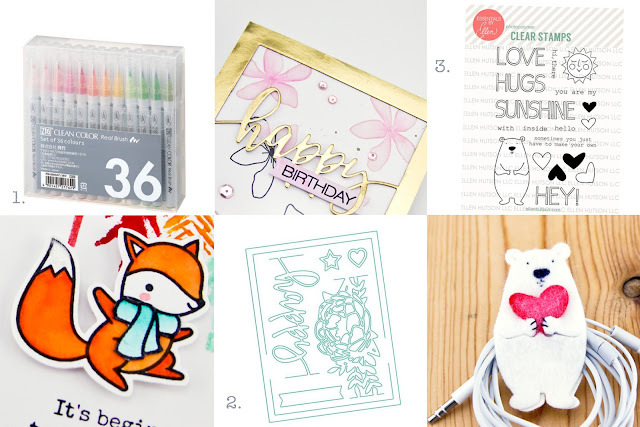 The adorable outline words mix & match with so many other sentiments (one of my favorite things to do) and that adorable bear melts my heart! Plus Mr. Bear is interactive (the die cuts his arms) and he is the perfect size for some holiday projects like ornaments & cord keepers (see sneak above of the project coming to my blog soon). Hope you are having a wonderful holiday weekend! Big hugs to you all! Oh Carly!! Your blog post is just so sweet and completely heartfelt...I can tell. You are one of those people that just oozes kindness and actually makes me look forward to calling EH. You have such a calming influence to your voice. And I WILL meet you someday! !